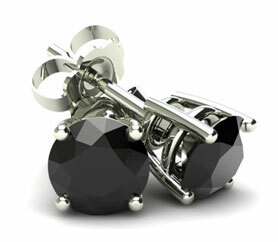 Black diamond studs prong set in white gold are classic and sleek. Whether your going out or staying in black diamond studs are always a go to choice. 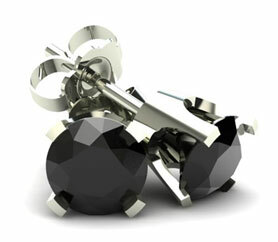 Add some drama to your jewelry collection with black diamond stud earrings that make a statement wherever you go. Perfect for adding the finishing touch to a stylish look, these unique pieces are trendy and a great choice for any jewelry lover. Pompeii3 offers several styles of black diamond earrings, all set in white gold for a classic and sleek appeal that is ideal for any number of special occasions or everyday wear. These round diamond studs look gorgeous and eye-catching and will allow you to achieve an eye-catching look that differs from typical diamond jewelry. With traditional settings mixed with the unique black stones, these round black diamond earrings are subtle and sophisticated, yet unexpected. They look gorgeous with everything from a holiday cocktail dress to your business casual work wear. 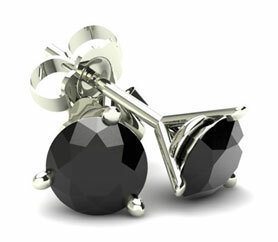 There’s something for everyone in Pompeii3’s collection of black diamond studs. You can also choose the color, clarity, and weight of your diamonds based on your style preference and budget. 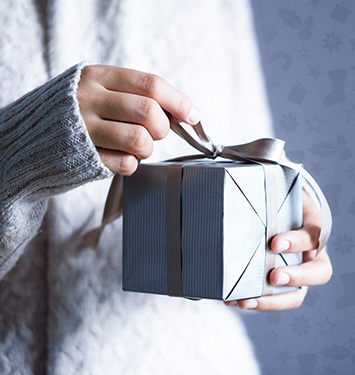 When you shop black diamond stud earrings at Pompeii3, you will also enjoy free shipping, a free gift box, free returns within 30 days and our 180-day warranty with each purchase. 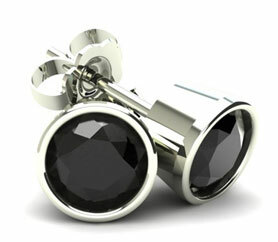 Shop for beautifully-crafted black diamond jewelry online today!